Freshwater red algae are presently classified into five classes based on recent molecular phylogenetic and supporting morphological analyses: Bangiophyceae, Compsopogonophyceae, Florideophyceae, Porphyridiophyceae, and Stylonematophyceae. 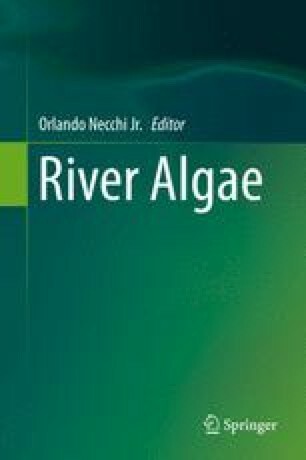 Red algae are well represented in river ecosystems and many freshwater members occur exclusively in lotic habitats. These algae are usually important constituents of stream floras, either in terms of abundance or distribution from local scale to biomes. This chapter treats all the genera from river habitats, with an emphasis on the benthic forms and macroscopic taxa. Basic descriptions of 26 genera are provided, along with illustrations and information on the habitat. I am grateful to the financial support from the Brazilian agencies FAPESP and CNPq (Brazil) for the several grant projects received along the years that allowed me a much better knowledge of the red algae. I am thankful to the following people for kindly sharing their images to be used in this chapter: Marina Aboal, Ignacio Bárbara, Javier Carmona, Chris Carter, Iara Chapuis, Tim Entwisle, Mitsunobu Kamiya and John West. The help in image editing by Cauê Necchi is greatly appreciated.